In the worst October weatherwise that I have seen in my 20 years chartering, we finally made our second overnight trip to the canyon with the Tom Hippler charter. 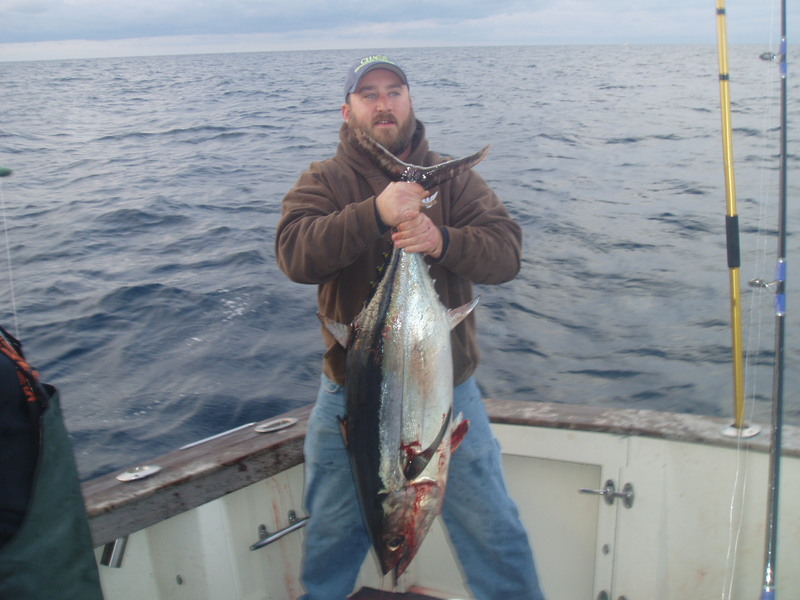 Despite my recommending we not make the trip because of cold water temps and slow reports from all the party boats, Tom and his crew had a more positive attitude and decided to go. Afternoon trolling was uneventful and we setup for the night early. We had no action till 4am when the sword line went off and after 30 minutes the fish broke off. Shortly after a flat line started screaming and during the fight took us around the boat and then the line got caught in the props. 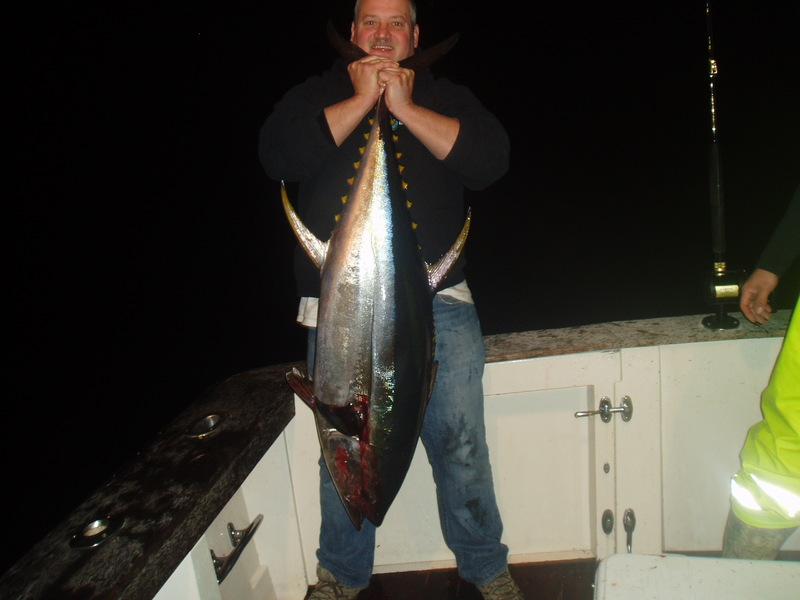 The fish was staying up high and the mate was able to gaff the line on the other side of the boat. One guy then began handlining the fish while we cut the line, retied it to the rod and resumed fighting the fish. We had seen blue sharks circling the boat all night and we thought it might be a shark but as he tired we could see it was a good sized yellowfin and it was soon gaffed, a 70 lber. The rest of the night we fought and released several blue sharks, had another big fish on that broke off, and caught two gaffer Mahi. We kept fishing after sunup and another flat line went off which yielded a 50 lb longfin. We trolled till 9:30 am with no bites and headed home with the two tuna and two mahi on ice. 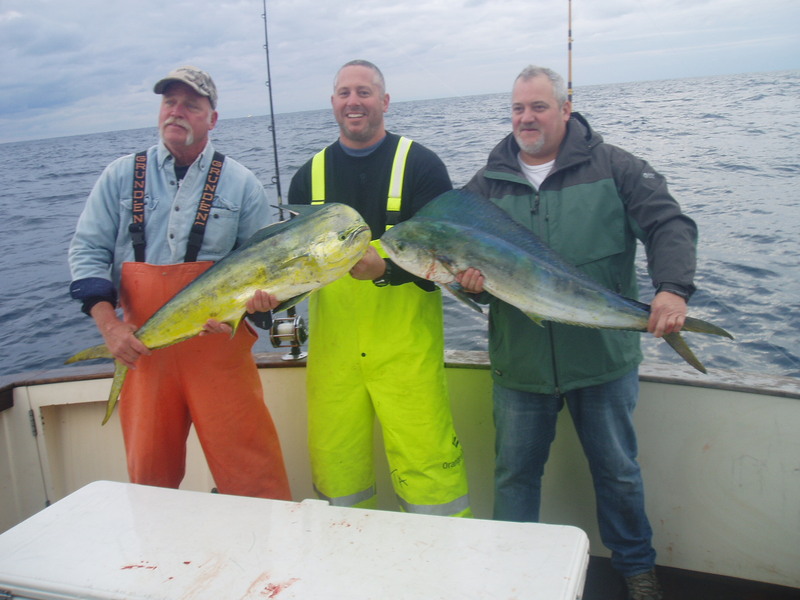 Tom and his crew’s optimism paid of with some action, a lot of fun and some meat to take home.